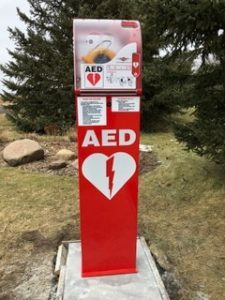 There are 48 neighbors who live in the Pine Point area of Sartell, and no one knows when or if one of them will have to use an automated external defibrillator stored at the neighborhood’s new “AED Save” station. Of course, everyone hopes they will never have to use it, but they are glad it’s there – just in case. Sudden cardiac arrest can happen anyplace, anywhere. For example, about a month ago a man dropped his daughter off for school at the Sartell-St. Stephen school district office for pre-school classes. The man had just left the building when Lori Traut, a paraprofessional, noticed he had collapsed outside the building. The staff called 911. Meantime, Kris O’Brien, director of Sartell-St. Stephen Community Education, grabbed an automated external defibrillator and ran out to the downed man. She opened the AED, listened to its verbal prompts, placed the paddle on the man’s chest and delivered a shock that started the man’s heart pumping again. The man, now doing fine, returned to the school once he fully recovered to thank everyone who helped save his life. O’Brien shared the story at a Sartell Chamber of Commerce meeting about a month ago. 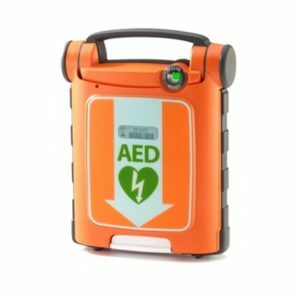 An automated external defibrillator (AED) is a small, portable machine that delivers an electrical shock to a person who has been stricken by sudden cardiac arrest. That happens when the electrical system in the heart goes haywire and suddenly stops the heart from pumping. Death is certain within 10 minutes, at most, unless cardiopulmonary resuscitation is administered and/or a defibrillator is used. Each AED gives voice prompts about how to use it. AEDs are now common in public places such as schools, athletic fields, law-enforcement stations, squad cars, ambulances and hospitals. However, they are unfortunately off limits to the general public, especially after hours when they are inaccessible in locked-up buildings. That is why the concept of AED Save stations began. Save stations are secured “boxes” that can be placed in neighborhoods or other spaces. Each contains an AED that can be used right there or taken from the box to be used elsewhere in a crisis. The boxes are protected by an automatic system from hot and cold extremes of weather; each has an alarm system; and each box can automatically send an alarm to neighbors when an emergency occurs (triggered when the box it opened and defibrillator removed). So far, there are three AED Save stations in the greater St. Cloud area – two in St. Cloud, one in Sartell. In the first half of this year, there has been a concerted effort by many people who hope to install at least 25 more stations. 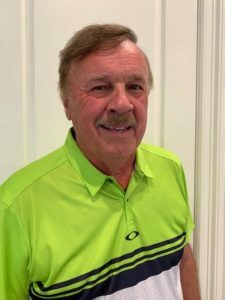 Rich Feneis, a retired owner of a sign company, lives in Sartell’s Pine Point neighborhood and spearheaded the move to get the Pine Point Save station. Feneis arrived at the subject of AEDs in a roundabout way. A long-time friend is Joel Vogel of St Joseph, who is a member of the Mending Hearts organization. Vogel, a true believer in AEDs, suggested Feneis apply for a Save station grant to CentraCare Health Foundation. Two other friends, both of St. Cloud and Feneis’s golfing buddies – Jeff Skumautz and Dan Schirmers – also inspired Feneis. Those two men raised funds and started the ball rolling to get the two Save stations now installed in St. Cloud. Feneis heard about AED Save stations in the Centerville, Iowa, parks system. He made some calls and heard rave reviews about the stations. CentraCare Health is a strong supporter of the Save stations, and it began a pilot program to install – at first – just three Save stations in the area. It is coordinated by Sharon Mentzer of CentraCare’s Heart and Vascular Center. Those three stations are the first outdoor stations, accessible 24/7, in Minnesota. Feneis started a fundraising effort. Fully 70 percent of Pine Point residents contributed a total of $5,500 – enough to buy the concrete support, the smart cabinet inside the station’s box and electrical lines to the station. The grant from CentraCare provided the rest, including the AED itself. As part of its ongoing pilot program, CentraCare also schedules CPR training sessions, many of them taught by cardiac-arrest survivors. Recently, a CentraCare-sponsored training session at Sartell Community Center attracted 25 learners. Feneis predicts the AED Save stations will someday soon become as common as telephone booths – or well, as common as telephone booths used to be, once upon a time. A next logical step, Feneis said, is to get people to learn the Save station locations. 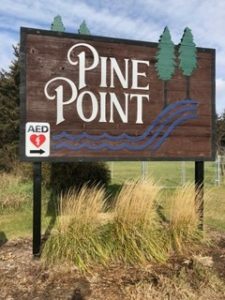 At Pine Point in Sartell, for instance, the red-white-black AED logo was placed on the large prominent Pine Point sign on the main road leading from Sartell to Rice. The logo, a red heart with lightning zig-zag in its middle, has a black arrow pointing down the side road to where the Save station is located. AED advocates all emphasize that knowledge is power, and the more people learn about heart problems, CPR and AEDs the more lives will be saved. Even children should be taught CPR and how to use an AED, they advise. The basic difference between sudden cardiac arrest is when the heart stops due to a kind of electrical seizure. A heart attack, on the other hand, is caused usually by some kind of blockage in an artery when the heart does not get enough oxygen. Many who suffer heart attacks have time to get emergency treatment. That is not true with those who suffer cardiac arrest, which is so sudden that unless someone else is present to help, death is virtually certain. AEDs can also be used when people are suffering “heart attacks,” as well as sudden cardiac arrests. About 360,000 people die of cardiac arrest each year, and 80 percent of them happen at home. Only about 8 percent of them survive. However, if CPR and/or AEDs are used, the survival rate is 70 percent. This is the Pine Point neighborhood sign along the major road leading from Sartell to Rice. Note the directional sign pointing to the AED Save station. This is one of many brands available of an automatic external defibrillator. This one costs $1,695. Most range from $1,200 to $2,500.